Collinite Auto Cleaner Wax has replaced the Collinite Liquid Sapphire Auto Wax with a new and improved formula! Safe for use on clear-coated surfaces! Auto Cleaner Wax cleans, polishes, and protects in a single step! 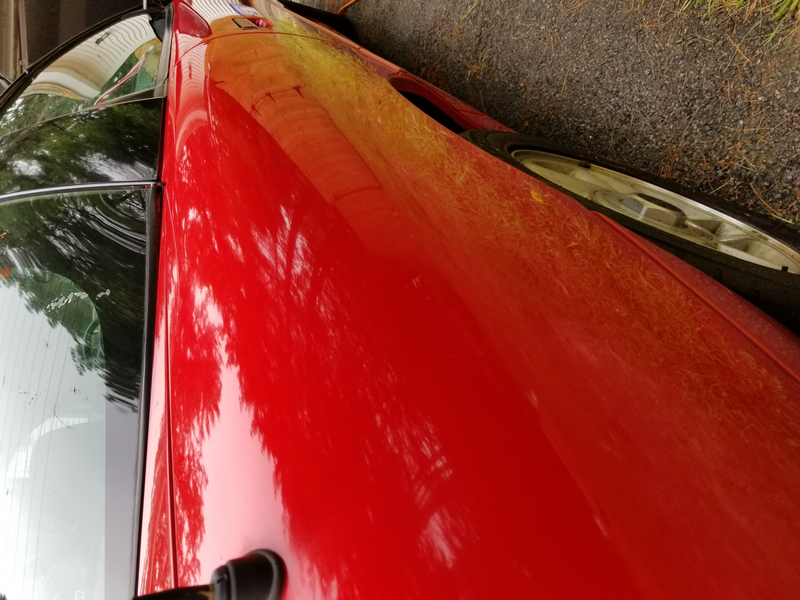 Collinite Auto Cleaner Wax is an easy-on, easy-off, all-in-one cleaner that will eliminate debris, staining, and light water spots, while leaving behind a layer of carnauba-polymer protection and shine. It's the ideal combination of cleaning, protection, durability and ease of use and it's only from Collinite. Collinite Auto Cleaner Wax preps and protects your vehicle's finish in one step to create a durable, vibrant shine in less time. Micro abrasives safely remove light oxidation and paint contamination to create a crisper, clearer finish. At the same time, genuine carnauba wax bonds to the paint to provide lasting protection and shine. Collinite Auto Cleaner Wax takes advantage of carnauba's natural tendency to fill in fine swirls to yield a more uniform, flawless luster. First and foremost, Collinite Auto Cleaner Wax is a wax. Its cleaning properties may not totally replace polishing if your vehicle has moderate swirls and oxidation. But it is a shortcut when you prefer to forego a prewax cleaner. You'll enjoy the benefits of brighter, more vibrant paint and rich carnauba gloss in one step! Collinite Auto Cleaner Wax offers incredible paint protection and durability. Like all Collinite products, its water-beading characteristics are second to none. You can see how the finish repels water and discourages foreign matter from sticking to the finish. Regular washing is all it takes to maintain the protective coating. Collinite Auto Cleaner Wax is detergent resistant so regular washing will not diminish its protection or shine. According to the bottle, this wax will last up to 2 to 3 months! It only takes drops of Collinite Auto Cleaner Wax to cover a single panel. Use the wax sparingly and in very thin coats. Apply Collinite Auto Cleaner Wax easily by hand or with a polisher. Apply and remove Collinite Auto Cleaner Wax to one panel at a time, going around the entire vehicle. Collinite Auto Cleaner Wax does contain cleaners so it cannot be layered over itself. If you do wish to apply multiple layers of wax, top it with Collinite Insulator Wax #845, Super Doublecoat #476S or Marque D'Elegance #915. All three are excellent carnaubas with no cleaning properties. Clean, polish, and protect in one step with Collinite Auto Cleaner Wax! *Note: Collinite Auto Cleaner Wax is clear coat safe, but is not meant for brand new paint or paint finishes that are already in pristine condition. Not for use on vinyl, rubber, trim, or glass. Collinite Liquid Insulator Wax #845Collinite Super DoubleCoat Auto Wax #47618 oz. Collinite Super DoubleCoat Auto Wax #476Collinite Marque D’Elegance Carnauba Paste Wax #915Collinite Paste Fleetwax #885Collinite Sapphire Leather & Vinyl Treatment Wax #855Collinite Metal Wax #850Collinite Fiberglass Boat Cleaner #920Collinite Liquid Fleetwax #870Collinite Fiberglass Boat Wax #925Collinite Metal Wax #850 64 oz.Collinite Fiberglass Boat Cleaner #920 64 oz.Collinite Liquid Fleetwax #870 64 oz. Insulator wax is easy to apply and buff, which I do by hand. The consistency is between a liquid and a gel; gel when cool and liquid when very warm. I have used this product for years and have always been very pleased. Difficult to find in auto parts chain stores. Very happy that Autogeek carries it! Hard to work with, there are better cleaner wax out there! I wasn't happy with this product,I will stick with Wolfgang products. ConsHard to apply and remove! This product is great at removing tar and bugs. All collinite products, remove when wet for easy removal. Great wet look shine. Lasts as long as most other good waxes. ProsGood for all paints. Great for polished and or sealed surfaces. ConsRemove wet. Really not a con. Put on and take right off with a good quality micro fiber cloth.